Although their dealers asked Mike and his wife and business partner Dee to create budget-priced pieces, those pleas fell on deaf ears until they felt satisfied their craftspeople were able to trim costs without hurting the beauty or durability of the products. “Our dealers told us they had customers who aspired to our unique heirloom-quality line with its lifetime warranty, but the purchase of one of our bedroom or dining room sets was not realistic for them,” Dee said. “We strongly believe that in today’s stressful world, log furniture takes us back to nature and a more peaceful way of existing. It was difficult for us to accept that we didn’t have furniture choices for a segment of the market. Now with the Rustic Arts Log Furniture line, we have products for those families—and some commercial markets too. We also expect that many of those purchasers will move up to our Heirloom line over time,” she added. The timing could not have been better for the introduction of this budget line. As Baby Boomers approach retirement age, many have purchased country homes and cabins with the intention of living there part time now and full time in retirement. This trend has fueled the log home industry’s explosive growth, and the O’Connells have happily ridden those coattails. “Even traditional furniture stores who in the past would never think of stocking log furniture are waking up to this trend and contacting us to help them meet the demand for unique rustic furniture,” Dee O'Connell said. While creating the Rustic Arts Log Furniture line consumed much of Mike O’Connell’s time in 2006, he also rededicated himself to increasing the already high sustainability quotient of their furniture manufacturing process. With a gleam in his eye, he noted: “Sustainability is such a hot topic that the U.N. declared 2007 as the Year of Sustainability, and you can’t pick up a magazine, newspaper or see a TV program without some mention of the topic. 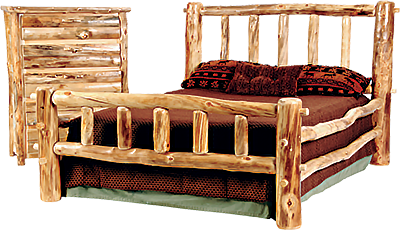 Yet, sustainability has always been a focus of Mountain Woods Furniture.” He explained how they primarily use “dead standing” aspen trees for their furniture. That usage provides them with the raw materials to create unique beds, armoires, tables and chairs--but also cutting those dead trees makes the forest healthier!” The sustainability efforts do not stop with their wood selection. Dee O’Connell speaks to their careful selection of finishes and sanding methods that help keep their “family” of workers healthy and safe. “We want our customers to feel good about every aspect of our furniture—even the handcrafting and finishing process,” she said. For more information, please contact , Mountain Woods Furniture at 866-689-6637.